How can I prepare for my project to begin? Before the project begins we will meet with you to go over details that will ensure smooth operation. Access to the property and structures if needed such as garage door openers or keys, storage of materials and equipment must be determined and agreed upon before the project begins. It is the client’s responsibility to point out any restrictions specific to their home and/or neighborhood that Home Builders should be aware of. How will I choose paint colors and fixtures? Home Builders will help with this process in any way possible. Fixtures, colors, etc. are to be chosen before project is started to prevent delays. We are providing a list of contact information for those specialty vendors we work with and trust for quality and service. What if I want to change some details? Design changes during project will delay project, and work will not proceed until a change order is signed and paid for. No architectural changes will be made on site. Work will stop and only proceed after new drawings are attained, signed and permitted (if required). Please discuss these matters directly with your contact person from Home Builders as soon as possible to decrease delay. What if I have additional work being done by other Contractors? We will need to know if other contractors will be working on our project so all scheduling can be coordinated to prevent delays. Home Builders can not be responsible for supervising other contractors. What about custom items such as cabinets? Can Home Builders get them for me? Custom orders will only be ordered after design approval and deposit is paid. Approximate time frame for custom ordered items: cabinetry 4 to 6 weeks, doors and windows 3 to 4 weeks, counter tops 2 to 3 weeks. Only after items have arrived and are inspected can an install schedule be given. How long will my project take? Additions and large remodels can take 3 to 4 months, depending on many factors including weather. 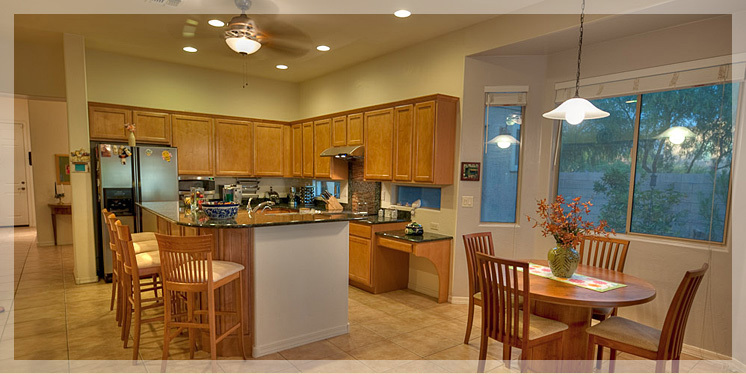 Kitchen and bath remodels usually are complete in 3 to 4 weeks once all products are chosen and have arrived on site. Window or roof replacements usually take 1 to 2 weeks. We try to arrive on site daily at 7:30 am and finish for the day around 4pm. Alterations can be made to that schedule upon request. How long does it take to get a permit? Permitting process will take from a week to 5 weeks depending on magnitude of project. We will not perform any “major remodeling” without an approved design and building permit. How are arrangements made for payment? Payment procedures: short duration project we require 50% deposit and 50% payment upon completion. Larger project payment schedule: deposit upon signing of contract and the remainder of payments will be based on performance of phases with a hold back amount only paid after punch list (if one exists) is completed. As a Licensed Contractor, do you do construction liens? Yes, we will open a preliminary lien on all projects over $5000 and an appropriate lien release will be given after all payments have been made. Do you supply a warranty on your work? We provide a two year workmanship warranty with all our work. It is your responsibility to register all manufacturers’ warranties and exercise those warranties. Once my project begins, how does scheduling affect me? We try our best to stay on track and complete projects as quickly as possible to everyone’s satisfaction. Our staff is professional and respectful of client’s time. However, we cannot dictate weather, equipment failure, and personnel. We will do our best to keep you informed. How will Home Builders’ crew respect my space? We will not use home owner’s bathroom without permission and will provide a portable potty on all long duration projects. We will not smoke and/or drink alcoholic beverages in and around your home. We will protect flooring and other personal items as much as possible. Home Builders will not under any circumstances move any electronics or appliances. This does not include appliances that are being replaced as course during a remodel. Stereo equipment, speakers, televisions, and any other electronics can not be moved by our crew. The client must be responsible for moving any items out of the path or room where contracted work is to begin. Please discuss this with your Job Foreman if you have any special requests or concerns in this area. Is Home Builders Licensed and Insured? We carry complete liability and comprehensive insurance coverage, above the state required limits to retain our ROC License. We are also Bonded. What if things are just not going as planned? Things sometimes go awry. Please feel free to speak to the Job Foreman , the office staff or the owner at any time with any question or concern. Our goal is your complete satisfaction and we will settle for nothing less. Please feel free and encouraged to ask any question, express any concern and notify us of any special instructions or development during the process. We are working with you! THANK YOU FOR CHOOSING HOME BUILDERS LLC. WE LOOK FORWARD TO A LONG AND HAPPY RELATIONSHIP.